The point-to-multipoint fiber used as an update of the ADSL service with FTTH technology is being deployed along the Catalan cities. GRN, hopefully, will be able to offer this service during the year 2014 in Girona. Point to point link with GRN using our own fiber or third parties. Using this method we can interconnect multiple sites together and give it more Internet traffic. Such connections require a custom project, please contact our technical department. 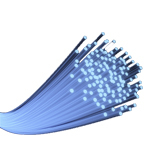 If you are interested in fiber connectivity, ask for more information at admin@grn.cat.